Item # 289937 Stash Points: 895 (?) This is the number of points you get in The Zumiez Stash for purchasing this item. Stash points are redeemable for exclusive rewards only available to Zumiez Stash members. To redeem your points check out the rewards catalog on thestash.zumiez.com. The Toy Machine Monster Red crew socks feature the Toy Machine monster with yellow eyes at the top of the foot, "Toy Machine" in white letters at the bottom, and two white stripes at the top of the sock for an athletic look. 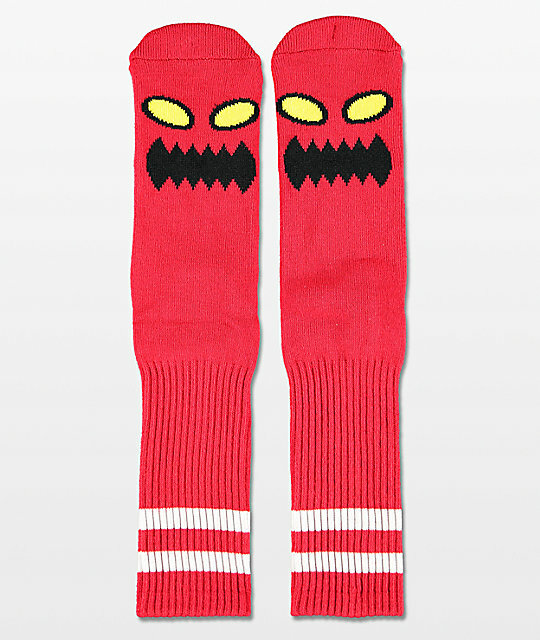 Monster Red Crew Socks from Toy Machine. Monster with yellow eyes and sharp red teeth. "Toy Machine" in white letters.